Paul Malone scored for Peterborough Sports at Basildon. Peterborough conquered Essex today (September 8). As Peterborough United were winning 3-2 at Southend United to stay top of League One, 11 miles up the road Peterborough Sports were cruising to a 2-0 win at Basildon United in the first qualifying round of the FA Cup. Scott Mooney scored for Deeping Rangers at Holbeach United. It was a top performance by Sports in a battle between two step four sides with perfect winning league records this season. Josh McCammon scmabled home the first goal for the city side iin the first-half with central defender Paul Malone sealing the win with a powerful header from a Lewis Hilliard cross after the break. Sports have guaranteed themselves £8,000 in prize money with the prospect of more to come. The draw for the second qualifying round is on Monday (September 10) and Sports will be the only local team with an interest after defeats for Spalding United and Wisbech Town today. Alex Beck fired Wisbech in front at Great Wakering Rovers - a team from the same division as Basildon - but the hosts eventually ran out 3-1 winners. Spalding suffered a shock 1-0 defeat at lower level Brantham Athletic, falling to a goal 18 minutes from time. That defeat led to the departure of Spalding manager Chris Rawlinson. There was also late woe for Yaxley who suffered a fourth straight loss in the Evo Stik Southern Division One Central. 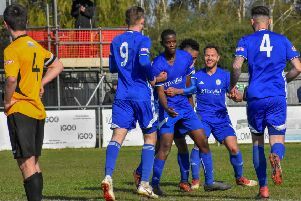 Ross Watson shot the Cuckoos into a third-minute lead at Welwyn Garden City and Tom Waumsley restored that lead midway through the second half before the home side struck twice in the final three minutes to pinch the points. Deeping Rangers won the big United Counties Premier Division derby at Holbeach United, coming from 2-0 down to win 3-2 and move up to third place. Former Deeping player Johnny Clay’s own goal sealed the comeback win after Danny Durkin and Scott Mooney had cancelled out first-half strikes from Billy Smith and Josh Ford. Deeping claimed the winning goal after being reduced to 10 men as midfielder Charlie Coulson collected two yellow cards. Pinchbeck United stay top after seeing off Sleaford 2-0 at the Sir Halley Stewart Field in game which saw the visitors miss two penalties in the space of five minutes when a goal behind. Ricky Lovelace saved the first one with the second spot-kick missing the target. Ollie Maltby and debutant Lee Beeson scored the Pinchbeck goals. Peterborough Northern Star won for the second Premier Division game in a row, 2-1 at Leicester Nirvana with Christian Le and Kieran Blanchard on target. Jack Bates and Matt Simpson scored the goals for Blackstones as they beat Huntingdon 2-1 to stay third in Division One, but Bourne were well beaten 4-1 at home by Aylestone Park. Zak Munton scored their consolation goal. Jack Friend equalised for Wisbech St Mary at Cornard Rangers in Division One North of the Eastern Counties League, but the home still had time to bag a winner. March were thumped 4-1 at home by leaders Harleston despite another goal for in-form Toby Allen. First Round Qualifying: Brantham Athletic 1, Spalding Utd 0; Great Wakering Rovers 3, Wisbech Town 1 (Beck); Basildon Utd 0, Peterborough Sports 2 (Malone, McCammon). Division One Central: Welwyn GC 3, Yaxley 2 (Waumsley, Watson). Premier Division: Holbeach Utd 2 (Smith, Ford), Deeping Rangers 3 (Durkin, Mooney, og); Leicester Nirvana 1, Peterborough Northern Star 2 (Le, Blanchard); Pinchbeck Utd 2 (Maltby, Beeson), Sleaford Town 0. Division One: Blackstones 2 (Simpson, Bates), Huntingdon Town 1; Bourne Town 1 (Munton), Aylestone Park 4. Division One North: Cornard Utd 2, Wisbech St Mary 1 (Friend); March Town Utd 1 (Allen), Harleston Town 4.